Somaliland is little known to most people. It is a self-declared republic, independent of Somalia, but recognized by no other state, including Somalia. It seems the people of Somaliland are suffering in obscurity. A few aid agencies are present, but not nearly enough to make a real difference. There are already reports that people are dying of hunger. “Even all the camels are dying,” says Ali Hugur, the mayor of Bali-Shireh, a district about a 3-hour drive south of Somaliland’s capital, Hargeisa, on the border with Ethiopia. “We’ve lost 70% of the camels, with the 30% remaining in terrible condition,” Hugur says. He added that, in all his 59 years, he’s never seen such a horrific drought. Half the population of Somaliland, 2 million people, is struggling to survive hunger that has swept across the vast expanse of powdery plains that mirror the whole of Somalia. According to the United Nations, 6.2 million people—more than half the country, and a number equal to the state of Massachusetts—are going hungry. Some 185,000 children could die of starvation if they don’t receive urgent medical attention within weeks. Meanwhile, the rains that should have started 3 or 4 weeks ago, again haven’t come. There hasn’t been a good rain in over 2 years. 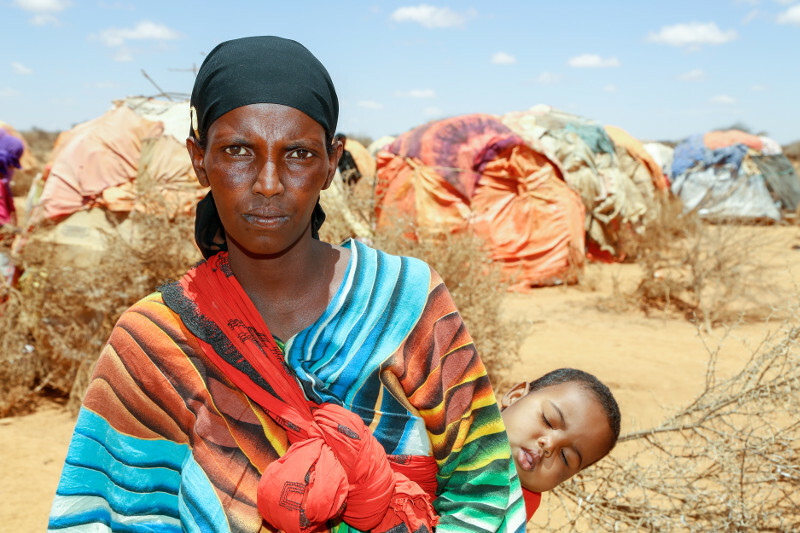 The crisis in Somaliland offers a glimpse into the devastating effects of drought that are probably similar in areas across Somalia that many aid agencies cannot reach because of insecurity. Caritas Somalia, via a small office in Hargeisa, recently trucked in supplies of rice, flour, cooking oil and other food to help some 160 families who have converged on the only water source within 50 miles or so—a borehole drilled years ago. Their arrival added to the 80 or so families who were already sheltering in the area. Normally, these families would be dispersed across the region, herding their animals toward good pasture and water, and pitching their homes of makeshift tents wherever they drove their animals. Generations of Somalis here have survived entirely on raising sheep, goats and highly prized camels. They provide meat and milk, and when people need to buy something, they sell animals for cash. “Most families end up here once their last animal is dead,” says Hugur. “Then, they pick up and come here, and hope—and wait for help,” he says. For miles, there is only dead scrub brush jutting out from silty brown sand, occasionally punctuated by the carcasses of a herd of goats. There are no roads. People don’t have cars. So they set up camp next to the water. What’s striking, amid the desolation, is the way people share what little they have. While it seems unsustainable, what the people will need once they come through this disaster—probably having lost loved ones, including children—is livestock to replenish their herds. Although Hugur says the young may be able to find another vocation with education, “For the rest of us, we are a simple people, and this is our way of life. “We don’t know any other way,” he says. Mohamed Dahir, a program manager with Catholic Relief Services in Somalia, says raising livestock can be a sustainable enterprise here. “One of the major potential sources of income, and a major source of revenue even now in Somalia, is in livestock-raising,” Dahir says. 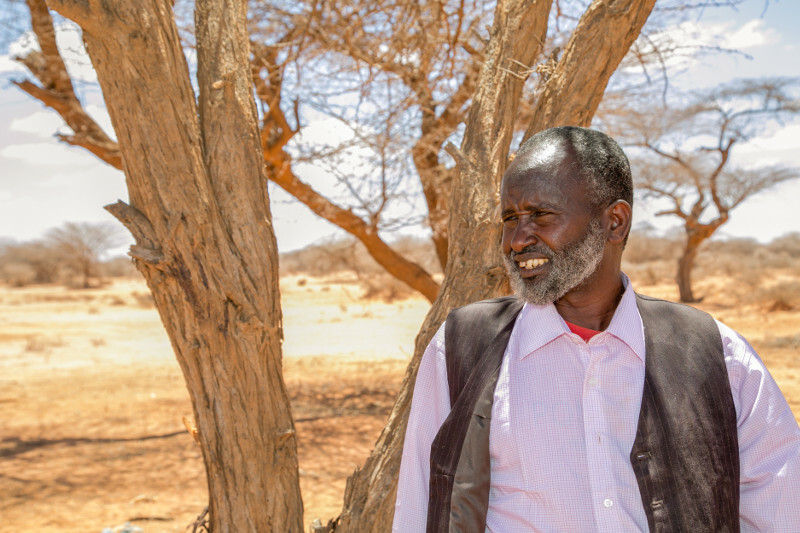 “If pastoralists can adapt, for example, by shifting toward fodder production instead of just leaving it to the whims of nature, then pastoralists will be better able to withstand the uncertainties with the weather and climate change,” he says. He says that veterinary systems could be strengthened too, to help animals fight off disease. “There is a huge market for animals to be sold to Saudi Arabia and the wider Persian Gulf area,” he says, noting it’s one of Somalia’s biggest businesses. But it’s also one that has been interrupted by the war in Yemen—the country refugees are arriving from. Both Somalia and Yemen are expected to face famine as international humanitarian groups remain underfunded and overwhelmed. 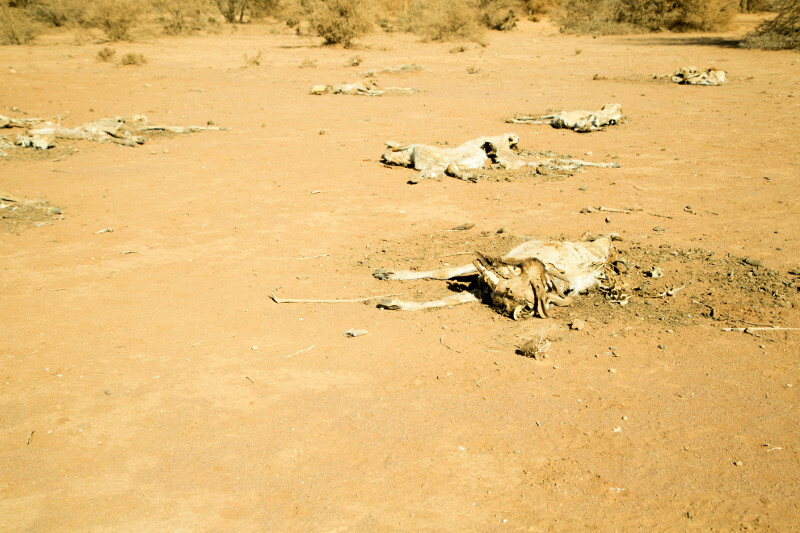 Both countries suffer from violent conflict and insecurity, on top of drought. In East Africa and the wider Horn of Africa, more than 20 million people are struggling to find enough to eat. CRS closely partners with Caritas Somalia in providing funding for a number of initiatives. We supported drought response work in Somaliland in 2016 and helped re-establish the local parish and Caritas office. CRS also supports education for girls and marginalized Somali clans, as well as assistance for Yemeni refugees.